How can the Kingdom of God transform the powerlessness of the poor?Jayakumar Christian argues that in order to provide sustainable solutions to powerlessness, poverty and oppression, it is critical to challenge and redefine power from the perspective of the kingdom of God. Only when we realise that we are all 'empty-handed' before God can broken relationships be restored. 'This is an important book. Written by a deeply experienced and thoughtful practitioner, it is theologically deep and fundamentally sound in terms of its social science. This is a must-read for any Christian interested in working for transformation among the poor' (Dr Bryant L Myers, Professor of International Development, Fuller Theological Seminary). 'Jayakumar has worked among the poor for more than 30 years and demonstrates a profound personal relationship with 'the God of the Empty-Handed'. This is a modern classic and this revised edition is a major contribution to development thinking and practice in the twenty-first century' (Revd Tim Costello, CEO, World Vision Australia). 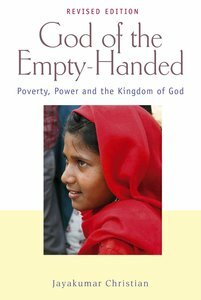 About "God of the Empty-Handed: Poverty, Power and the Kingdom of God"
Dr Jayakumar Christian is National Director of World Vision India. He and his family live in Chennai, India.